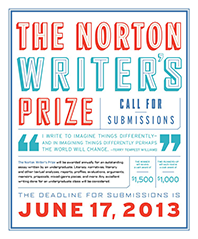 W. W. Norton’s decision to replace its Scholar’s Prize with the Writer’s Prize reflects some recent and not-so-recent changes in undergraduate writing assignments. From 1998 to 2008, the Scholar’s Prize recognized what Norton calls “an outstanding undergraduate essay on a literary topic,” an essay of the sort that many of us who teach composition frequently wrote when we were freshman. Our own students write fewer literary analyses than we did, because many composition courses are no longer literature based. Instead, they’re interdisciplinary. For their final major writing assignment of the school year, my students wrote ethical reasoning arguments per program requirement. But over the course of the year, they also wrote blog posts, snail mail, personal narratives, timed essay exams, cover letters, résumés, and highly imaginative scripts in which they placed themselves in conversation with the writers of some of the articles and essays they’d read. For some students, those scripts evolved into traditional research arguments. For others, the process of working with those sources revealed that their real research interest lay elsewhere. I wish I could have nominated more than one piece of writing. For reasons of privacy, I won’t address the particulars of the one that I chose, and I won’t offer any details from the nominating letter that I wrote to accompany it. I will note, instead, how many students shone brightest when an assignment took them by surprise, asking that they write in new ways.